Facebook co-founder and CEO Mark Zuckerberg and his wife, Priscilla Chan, donated $25 million to the U.S. Centers for Disease Control Foundation last month to aid the fight against the Ebola virus, and the social network announced Thursday that it is joining the fight with three related initiatives -- offering an easy way for users to donate to the cause, teaming up with UNICEF to provide information and working with NetHope to connect medical and aid workers in affected regions. Facebook co-founder and CEO Mark Zuckerberg and his wife, Priscilla Chan, donated $25 million to the U.S. Centers for Disease Control Foundation last month to aid the fight against the Ebola virus, and the social network announced Thursday that it is joining the fight with three related initiatives — offering an easy way for users to donate to the cause, teaming up with UNICEF to provide information and working with NetHope to connect medical and aid workers in affected regions. Ebola-related content was also added to the Internet.org application for Zambia and Tanzania last month. 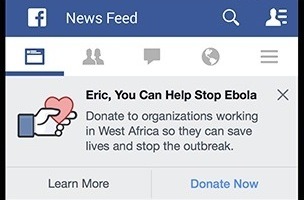 Organizations involved in the fight against Ebola are using Facebook to raise funds for their relief efforts. We want to amplify these calls for action and help organizations raise awareness and connect directly with people around the world. 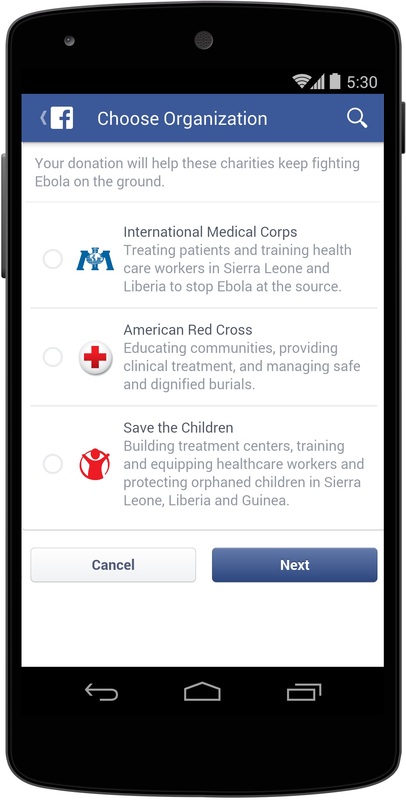 Over the next week, people on Facebook will see a message at the top of News Feed with an option to donate to three different nonprofits doing important work on the ground in West Africa: International Medical Corps, the Red Cross and Save the Children. To do this, we are using our donate feature, where people can donate directly to one of these three organizations. If they want to, people can also choose to share that they donated on Facebook. All of the money raised will go directly to the charities working on the ground. Please visit facebook.com/fightebola to learn more. Accurate public health information is critical to containing the spread of Ebola. We are working with UNICEF to deliver important education about Ebola symptoms and treatment to people in affected and neighboring regions. These UNICEF messages, which appear in News Feed in the appropriate local language, focus on Ebola detection, prevention and treatment. Communication and access to information is crucial to people fighting Ebola on the ground, but many of the areas most affected lack the infrastructure, like landline and cellular coverage, to support them. Working with NetHope, a consortium of 41 leading international NGOs (nongovernmental organizations), we are donating 100 mobile satellite communication terminals for deployment in remote areas of Guinea, Liberia and Sierra Leone and to provide voice and data services that meet the highest priority needs of medical and aid workers. These terminals, called Broadband Global Area Network devices, communicate via satellite and provide mobile broadband and telephony services. Focusing on areas where there is little to no existing communications capacity, NetHope will deploy these terminals to help medical and aid workers with contact tracing, communication, case management and community mobilization. Response organizations estimate that for each patient, at least 10 other people will provide health care, contact tracing and other services that may require telecommunications — and improvements are most important in rural areas where infrastructure is weakest and case loads are highest. 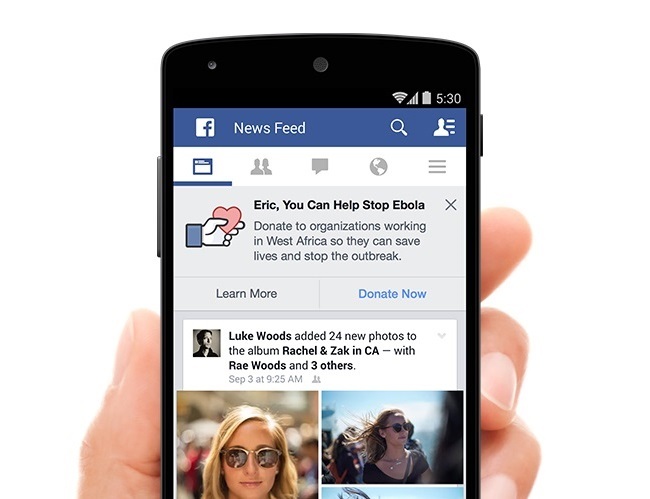 Readers: What do you think of Facebook’s efforts in the fight against the Ebola virus?